5:00 pm Dinner for participants, supporters and community at the Kiowa County Community Building located at the Kiowa County Fairgrounds, 15103 Highway 187, Eads. 7:00 am The Healing Run/Walk continues to Limon, CO, location to be announced. 7:00 am Continue Healing Run/Walk to Denver, CO, location to be announced. 8:00 am Ceremony Honoring Captain Silas S. Soule, Company D, 1st Regiment Cavalry, Colorado (U.S.) Volunteers and Lieutenant Joseph A. Cramer, Company K, 1st Regiment Cavalry, Colorado (U.S.) Volunteers. Continue Healing Run/Walk to 15th & Arapaho Avenue, Denver. 9:00 am 15th & Arapaho Avenue, Presentation: Captain Silas S. Soule Memorial Plaque. Immediately following this presentation, all participants will walk last mile to the Colorado State Capitol Building in Denver. For additional information about the 19th Annual Spiritual Healing Run/Walk, please contact event organizer Otto Braided Hair at (406) 749-4325 or Park Tribal Liaison Karen Wilde at (719) 469-5504. 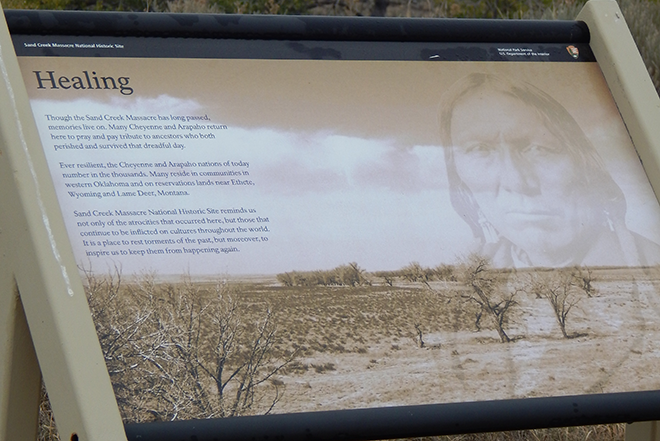 To learn more about Sand Creek Massacre National Historic Site call (719) 438-5916 or go to www.nps.gov/sand .